Incredibly, the end of the month is upon us already. November has been relatively quiet for me after the hectic pace of the past several months and my photo library feels a little sparse. In the spirit of continuing to challenge myself and try new things, last month I enrolled in art classes at a small nearby studio. As a result, I’ve spent a good chunk of this month heads-down, exploring this new world that’s opened up for me. I have no new-found latent talent that I can claim, but I’ve discovered that even someone ‘artistically challenged’ like me can learn some basic skills. I originally started out using acrylics, but I currently have 2 large canvases in progress using water-based oil paints. I’m not going to pretend that it’s been easy. My instinct is to over-think everything so the process has been painstakingly slow. It doesn’t help that I appear to be colour-challenged. November isn’t exactly a beautiful month around here. By the time November arrives, the leaves are mostly gone from the trees and the sun takes a holiday. If you like gray leaden skies, this is a primo time. I’ve already written about my excursion to Niagara Falls this month for the Winter Festival of Lights, but while we were there we visited a few other attractions – like the Falls themselves. The heavy mist coming off the Falls created stunning ice sculptures out of any stationary object. You could tell the direction of the wind simply by what was frosted in ice. These trees had been bare the day we arrived but overnight they were turned into giant popsicles. Welcome to November – this is a colour photo. A short distance north of the Falls is Lundy’s Lane – the scene of one of the bloodiest battles of the War of 1812 between the US and Britain. The battlefield is now a cemetery and a memorial to that battle. It was late in the afternoon when we visited Lundy’s Lane. We didn’t linger long in the deep chill of the fading sunlight and decided to revisit the following morning. 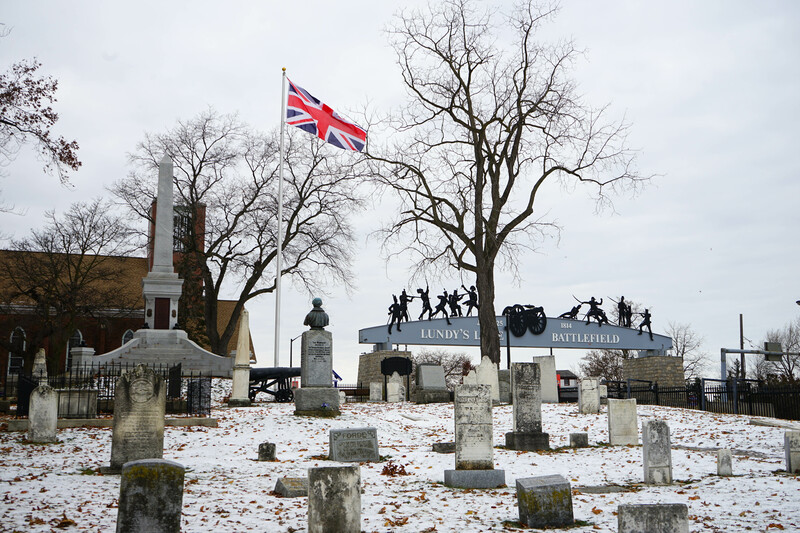 If you think it is odd to see the Union Jack flying on Canadian soil then you’re not alone. I did too, but then assumed it was because this was a British battle. It would be another 55 years following the War of 1812 before Canada would become a country and another 98 years after that before we would get our own flag. 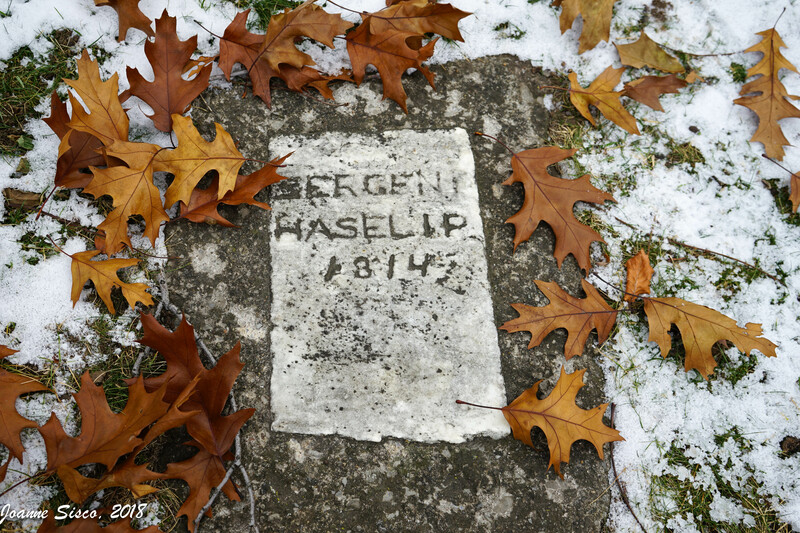 Many of the old stones are simple markers and some are now unreadable. 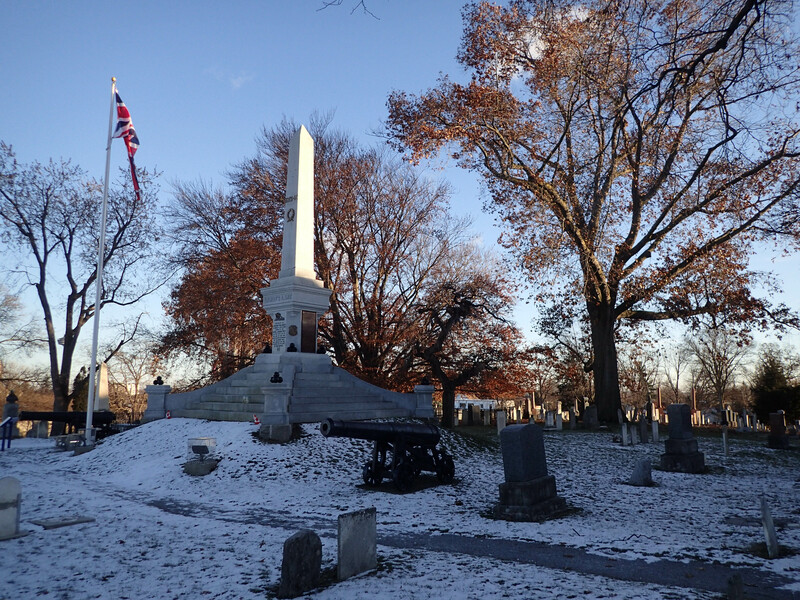 However, several new memorials were installed in 2012 for the 200th anniversary of this war. 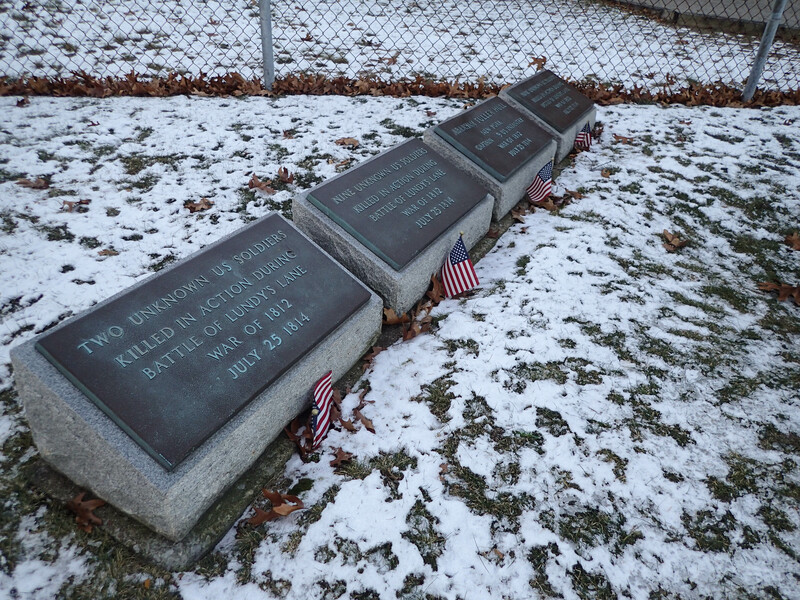 This included memorials for 20 unknown American soldiers buried on this site. So this was my November – gray, some snow, and mostly cold … but it’s been warm indoors playing with paints. Overall, I’d say it was pretty good. Not wanting to end this post in a cemetery, I leave you with a final image from the Niagara Falls Winter Festival of Lights. Coincidentally, we enjoyed a real full moon in addition to this version. Changing Seasons is a monthly photo feature hosted this year by Su Leslie at Zimmerbitch. How wonderful that you are taking an art class! I love your November photos — especially the Camp 30 photo and the top photo of the Battle of Lundy’s Lane. I have taken lots of art classes, even quite recently. And I’ve taught them too. I guess it’s like anything else – the more you learn, the more you appreciate there is to learn. Not to mention all the different styles and techniques that others use and share. And I just showed some of your photos to my family (we are visiting them in KS) and showed them the cold ice in that area! I do like to whine about the cold and winter in general, but I have to admit that I can’t imagine living without it. The extremes in seasons is what I’ve known my entire life and there is magic in in! Those trees… WOW. I am sitting here in the humidity of the Balinese night and wondering how it can possibly be SO cold elsewhere. With regard to painting, the best advice is just to keep at it and to focus on enjoying the process and not getting too attached to the end result. I picked up a paintbrush recently, for the first time in ages, and boy was I rusty. But if you enjoy the process, that ultimately is what counts. And now December is almost over… where does it all go? I know, Peta! The marching of time is outright scary sometimes. I have the same thoughts about the cold when it’s blistering hot and humid in the summer. How is it possible that a country could have such extremes in temperatures?!! “Welcome to November – this is a colour photo.” made me laugh. 😄 All that ice and snow is pretty. I know, I know, I don’t have to live with it. It’s still pretty. A lot of people really struggle with the grayness of November but it doesn’t seem to bother me. Now March … that’s a different story …. Thanks for your encouragement about my painting. It took a lot of mental back-and-forth before I finally bit the bullet and registered for art classes. Best thing I’ve done in a long while. I’m surprised you would find it intimidating. At least you can draw!! I’m having to learn how to do that at the same time! I tried a pastels class once but found it so stressful I’ve never done another art class. I need to find one of those ones with wine incorporated I reckon. Peta’s advice is good. I’m trying to get better at remembering the quote “Comparison is the thief of joy” and try and find what makes me happy in the process rather than how it compares to anyone else. The first 3-4 classes I took, I was really stressed and ‘enjoyment’ wasn’t a word I would have used. I was learning LOTS but overwhelmed by all that newness … kind of like being thrown in the deep end of pool when you don’t know how to swim. I seriously questioned whether this was something I wanted to continue doing. By the 5th session. I was starting to get the hang of my awkwardness as I realized I could actually apply some of what I was learning. What I’m saying is, don’t let 1 class turn you off. Maybe you need to try another studio. The instructor where I go encourages us to experiment and risk failure. She said that if she always told us what to do, we would simply become good at taking directions. I’m really good at making mistakes 😉 … but it doesn’t freak me out as much anymore. Painting seems like a nice practice to take up during the cold, gray days. I love the one that you’ve shared. I don’t think I could manage to paint so nicely. lol. Those ice trees and icy lamposts are magnificent! Thanks. It took me months to decide to take lessons. I wondered if I was trying to undertake the impossible, but I’ve been pleasantly surprised that with some good instruction, even I can paint! When I saw that piece of art I scrolled up to make sure I was on your blog. I was. Very nice. Keep up the good work. Looks a tad chilly up your way. May be time to put the BBQ away for next Summer. Clearly you are NOT artistically challenged! Acrylics are a good starting point, and I can’t wait to see your oil painting in comparison. I love the frozen spray on the lamps. Love them. Been years since I’ve seen anything like that in person, last I recall, Chicago. Years I tell ya! I do like the gray skies, I like not being hot. Though, to be honest, winter seems to be in a hurry here, and I was cold more frequently this November than I remember being in Novembers past… Brr! Thank you for thinking I”m not artistically challenged 🙂 Every once in a while I need to shatter the preconceptions I have of myself. Learning some basic art skills is not only giving me a new form of play, but I’m getting a much deeper appreciation for true artists and their craft. I love the Union Jack! I remember that in grade school we had to draw it – ruler, measuring, then colouring between the lines. No artistic skill needed! Your painting is so impressive Joanne! I’ve gone to those paint nights where one tries with instructions to copy an original. No matter the subject my painting always resembles an alien life form. Good for you to step out of your comfort zone. I went to one of those paint nights and although I had fun, I didn’t learn anything. We got zero instruction. The instructor of the courses I’m taking now is very good and I feel like I”m learning so much. I have a new respect for true artists! You took the plunge and enrolled in an art class! Good on you! I have always struggled with painting & drawing- can’t seem to match what is in my head to what ends up on paper or canvas. The icicles on the trees are so unreal! Thank you for braving the cold to bring us so many stunning photos from the Falls. I’m not going to lie – I have the same problem. However, I wonder if all artists feel that way. I suspect a great may do but that doesn’t minimize the effort or the end result. All the artists (beginners and veterans alike) seem to start out feeling tentative. But once they find their medium, there is no stopping them! Tentative is a great word for it. Artistically challenge? Highly doubtful with the finished product to show for! Lucky you to see those icicles. Now, this makes me want to visit my niece at Niagara Falls and visit the cemetery as well. With the cold temp and blue sky, I will trade it for the gray cloudy sky. Keep painting! Somehow I managed to miss your comment and I just found it accidentally. Thanks Judy. This was my 2nd time to the Falls in winter and it’s really a magical place. 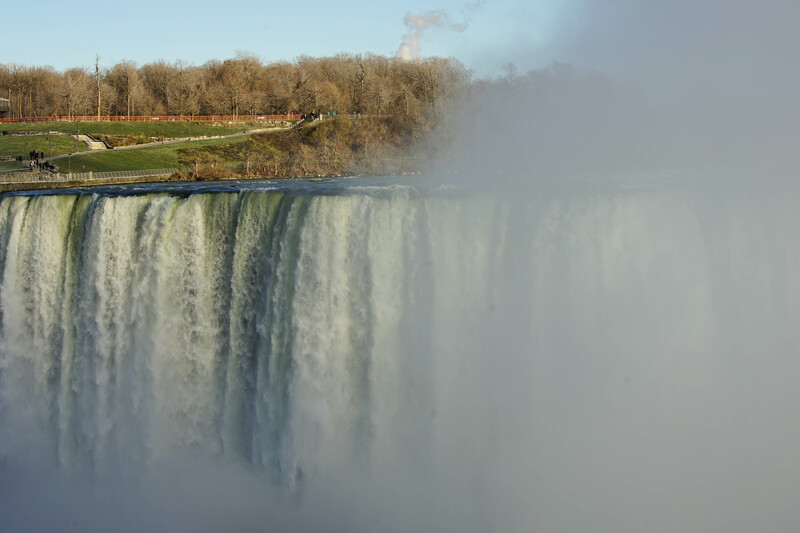 The mist coming off the Falls ices everything into a beautiful landscape …. but no doubt about it, it’s cold!! I love the painting! I dabbled in painting for a bit, years ago, and I would have loved to have taken a class. Hopefully we can always remain on good terms … would hate to have a repeat. These things never end well. Thanks Sue. I would have put myself in the same category – not being able to draw even a stick person. Imagine my surprise when I found I COULD draw when given some direction on creating a grid and working in one box at a time. It truly is amazing that the impossible becomes possible with some instructions on how-to! Sorry to hear that the heat has moved in already. I hope that you’ll be graced with wetter than usual conditions to keep the bushfires down. The wild fires are scary. Sue – btw, your blog is one of several that I’m simply unable to comment on. My comments seem to disappear into the ether. I’ve raised it with a few other bloggers affected and they’ve confirmed my comments aren’t going into their spam folders. I’ve already complained once to the Happiness Engineers at WP without resolution. It may be time for me to rattle their cages again. As usual, enjoyed your post and the fantastic pictures you have posted. I too have been somewhat restless to learn something new lately and since we aren’t traveling as much as we used to – I decided to expand my gray matter. I am a twin and my brother lost his wife a short while ago and we have reconnected so to speak. He loves to play with numbers and so has taken up Sudoku and is rather good at it. I on the other hand tried it some time back, enjoyed it, but put it aside when we were traveling several times a year. Just recently we re-connected and are challenging each other via Sudoku puzzles. I must admit, I have a long way to go to catch up to the talent he displays with the game. I have also looked into getting back to playing chess and am teaching myself the game again as we (my wife and I used to play some time back) hope to have some hobbies to fall back on when we slow down (not yet as we still both teach line dancing, take cruises, and visit each of our three children two of which live on opposite coasts. Sorry – didn’t mean to ramble on like this but I do enjoy seeing your posts and love the pictures. Thanks for sharing. I took a look at all my activities and discovered they were primarily physical in nature – cycling, hiking, etc. I wanted something that would challenge me in a different way other than simply reading more. So far the painting isn’t showing any addictive properties so I think I might be good – for now! Thanks for clearing up my question on whether that was a black & white or color photo! My goodness. Glad to hear you are trying out the art lessons. I love them and find the paint colors great in the winter time. I’m pretty comfortable learning things through the trial-and-error method, but I realized pretty early on that without some formal art instruction, I would simply get frustrated and give up. It took me a while to find a studio that felt right for me and I’m so glad I took the plunge. Thanks Marty. It’s the only true reproduction I’ve done. The others I currently have in process been modified – either by design or accident . Cemeteries are interesting places to wander through. I usually end up wishing I had good storytelling skills because they contain so much rich potential. Like most other people, i’m amazed and awe by those trees. Fabulous! Aren’t they gorgeous?!! I had to take them very quickly and leap back into the car. The mist coming off the Falls was freezing on my camera and I was struggling to keep the lens clear. Thanks Jude – but I don’t know about the ‘talented’ part 😏. So far I’m learning that I have a great deal to learn! 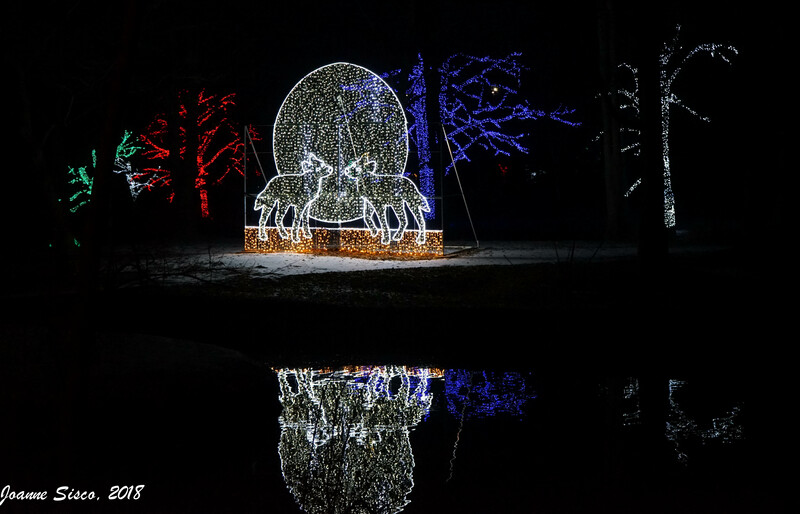 I hope you will definitely take in your winter festival of lights. I had never gone before either and now I have a list of events in the area I want to check out!! Brrrr! I like your painting. Color mixing is something I never quite got right. Stay warm. Colour mixing is so much harder than I thought … and I’m discovering I have issues recognizing nuances of colour. That’s where having an instructor guide me through the process has been so helpful. The popsicle trees are amazing (spot the Kiwi). I really like that you found an art class and that you’re enjoying it. Your painting is great; the colours really pop. I’ve never heard of water-based oils — seems like an oxymoron. Are they thick like oil, but faster drying? Can you get the lovely layering effect that oil paints do so well? I had never heard of water-based oils either. I’ve never worked with a regular oil paint but my understanding is that they have the same texture, layering, and blending characteristics except they aren’t toxic and clean up in water. I don’t know how long oil paints take to dry, but I find the water-based oils do take a day or two to dry enough to layer onto without causing blending. Thank you so much for your encouragement to find a studio. If I hadn’t, I’m sure I would have quickly become frustrated and quit trying. Now that I’m experiencing some of that, I can agree with you wholeheartedly. While I appreciate that I will never produce something of great value, there is calm that comes from a hobby that is enjoyed. I agree. I wonder sometimes if the general historical move away from artisan production to factories has made us focus too much on product and not enough on process — even in our hobbies. Great pictures, Joanne. We painted the dancing ladies in a wine-and-paint class. So much fun…try it! We were given virtually no instruction so I didn’t learn anything from that experience. The dancers were a good ‘warm-up’ for me. Initially I really struggled with mixing colours but I think I’m getting (marginally) better. Your painting is fantastic! We did Niagara Falls last winter and it was great, all frozen and white. Doesn’t the area around the Falls look like it’s straight out of fairy tale with all the frosted trees? So beautiful! Love the painting. OMG those trees! Thanks for sharing. I know! We were amazed at the trees too – especially since it seemed to happen so quickly! The Falls are one of those wonders that never ceases to attract me regardless of how many times I’ve seen them. 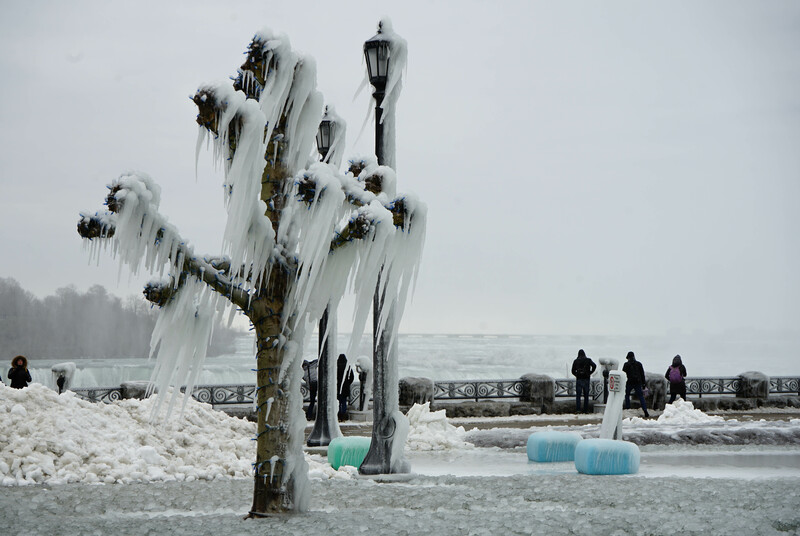 Those iced over trees are a great example – they had changed from one day to the next. It’s much too early for this kind of cold and snow. I’ve heard long range forecasts that say it’s going to be another brutal winter. Sigh. Your painting is FABULOUS ~> adding color to the grays/greys of November! I agree with the other commenters, Joanne. Your painting is very impressive! I recognize the trait of over-thinking. Most of all, I am impressed with your positive, take-charge attitude towards otherwise unpleasant weather. I am striving to adopt such an approach myself (she says as she dons her rain-gear to join her regular Thursday morning walking group)!! Your painting looks promising, even as a copy, I think you did well. I love the frozen spray on the trees. I’m glad you didn’t end with the cemetery, but I do like walking through them. It’s always somber here in November, but it’s a good time for reflection and thoughts for the future. It’s interesting you should say that, Dan, because November is exactly the time when I find myself thinking about the new year and the things I want to do. I hadn’t thought in terms of the somber weather contributing to that reflective thinking. 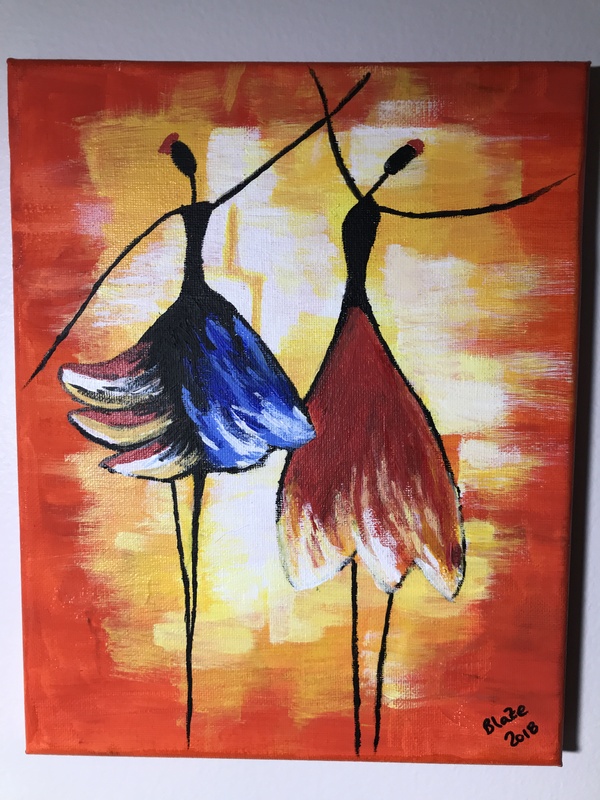 LOVE your painting – well done, Joanne! Also loved the caption under one of your icy photos: This is a colour photo…HAHAHA! That’s exactly how I feel about this dreary month of November – that all the colour has been leached out of it – I am starved – STARVED I tell you – for some colour. You’ll see that when I get my Changing Seasons post up, hopefully by tonight. Thanks Deb – you’ve been a huge inspiration to me in deciding to try painting. I’m enjoying the class time even though I do find it hard. Letting go of the ego and accepting that I’ll make mistakes (a lot of them actually) is NOT EASY! … but the instructor is an absolute delight. November is a month when a lot of people start to struggle. I’m usually good until February and then by March the wheels have fallen off completely. I love the ice sculptures the mist created Joanne 🙂 When I was up in Niagara I had to go to The Beer Store on Lundy’s Lane (what could I say I get very thirsty). I was reading about how historical that street is. Niagara Falls is one of those places that continues to marvel me regardless of how often I visit. There’s just something about all that thundering water! It’s a lovely collection of photos, Joanne. I’m not a fan of a cloudy sky either, but the color combination of gray and yellow-gold in “Camp 30” is strikingly beautiful. Have fun painting. I really like the one you showed here — even if you were copying. Hugs on the wing. 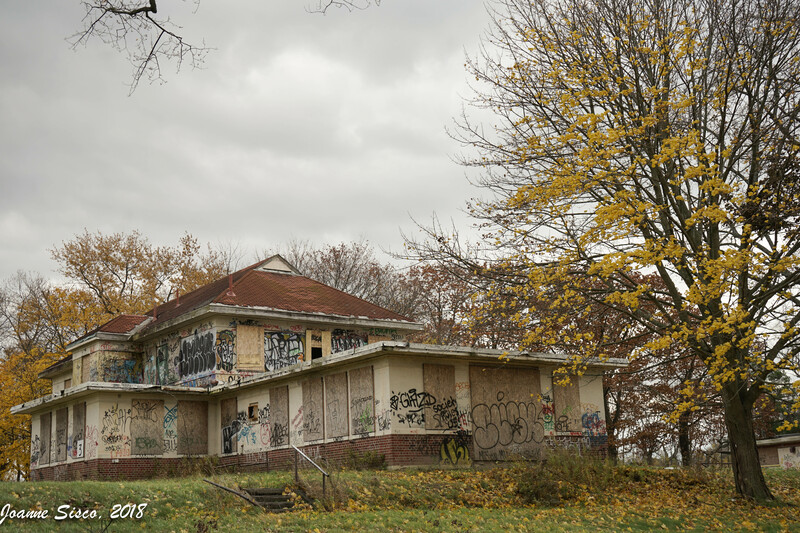 That murky November lighting was perfect for visiting an abandoned place like Camp 30. No question it set the mood! I love the gray photos with little pops of color! A long time ago I took a Chinese water color class. It was wonderful and hard. It gave me a love of Chinese painting but alas no real skill set to make anything remarkable. Good luck to you on your painting. 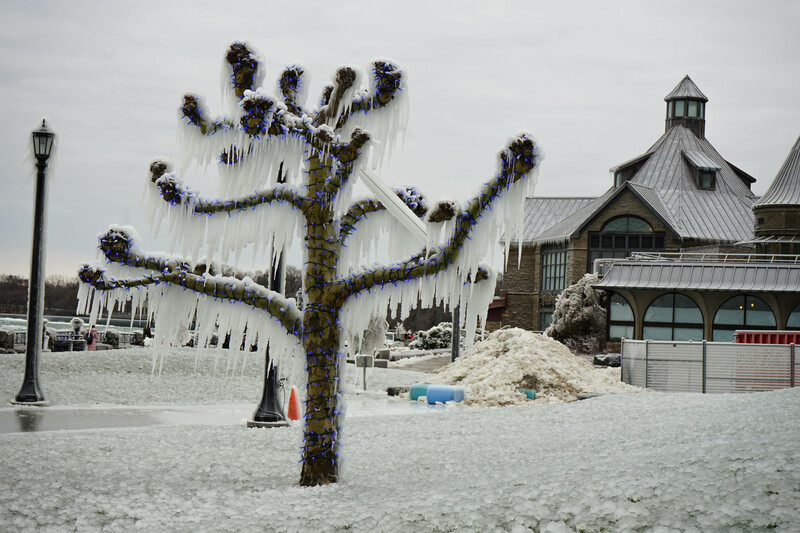 The two photos of the frozen trees are crazy beautiful–the blue haze…..gorgeous! I’ve been trying watercolors. I think latent talent is a misnomer. Mine is so latent I don’t believe it will ever surface. But it is fun, isn’t it? My understanding is that watercolour is very challenging! You have me ooo’ing and ahhh’ing. I’m glad I decided to go the route of taking art classes. Without an instructor to guide me through my missteps, I think I would have become frustrated at the very beginning and stopped trying. The icy photos in Niagra are beautiful, but they make me shiver. No, New England (and Canada!) is not beautiful in the late fall/early winter. It is gray and frigid. I am not missing that part. But, unexpectedly, I am having a difficult time “getting into” the holiday spirit. I’ve never celebrated Christmas without cold weather, ice and snow. People say I will get used to it. I hope so as it is my favorite time of year. And I love the painting! Keep exploring that part of your creative side! We were shocked when we saw the trees the next morning. That icy mist can certainly transform things quickly!! I’ve never spent a Christmas anywhere warm. I’d like to try it at least once, but you’re right. When you’ve been raised in the north, memories of the holidays include cold and snow. I would love to see Niagara Falls one day. And if I do, I might visit Lundy’s Lane, as well. Good luck with your art class. I think that battle was part of our last effort to absorb your country into ours. I enjoy these posts. Your month was varied and unique. Those old tombstones always tug at my heart strings. Names lost in time, but remembered in general. I’m like you – the old tombstones really called to me, especially on an old battlefield like this. I’ve been doing a monthly post for Changing Seasons for a few years now. It’s been an interesting way to reflect on the month and sometimes the themes that have arisen surprised me.